This was probably the Big List that I was most looking forward to compiling back in September just prior to training camps getting underway. Breakout players tend to be a bit easier to predict — or so I thought — and I had no shortage of hunches as to which young guns might take their game to the next level. Turns out, my spidey-senses weren’t as accurate as I had hoped, especially when it came to budding defencemen. That said, I’m quite pleased with my overall efforts, but I’ll save the gloating for another Big List in this five-part series that also covered Comeback, Bust and Rookie Sleeper candidates, plus my Top 100 Fantasy Defencemen. I’ve already rehashed the Comeback and Bust candidates, which revealed a mixed bag of results. Breakout candidates offered more of the same, although I at least batted above .500 on this front. Brock Nelson has been tearing it up for the New York Islanders this season, on pace for 36 goals and 72 points. 1) Mikael Granlund (F Minnesota) — 20 GP, 2 G, 7 A, 9 PTS = I was expecting him to be closer to a point-per-game. He has that potential. 2) Jonathan Huberdeau (F Florida) — 17 GP, 2 G, 6 A, 8 PTS = Same here, thought he’d be leading the Panthers in scoring thanks to being reunited with his junior coach Gerard Gallant. 3) Dougie Hamilton (D Boston) — 20 GP, 4 G, 7 A, 11 PTS = Got this one right, although it probably helped his cause that Zdeno Chara got hurt. Still, he’s one of the biggest breakout players in the league at this cutoff. 4) Alex Galchenyuk (F Montreal) — 20 GP, 5 G, 8 A, 13 PTS = He meets the criteria for sure, but I had his point total pegged even a little higher. That said, he’s almost doubling first overall pick Nail Yakupov from his draft year. 5) John Gibson (G Anaheim) — 4 GP, 2 W, 2.28 GAA , .927 Save% = He’s got all the potential in the world, but sadly he also has a groin injury that will keep him sidelined until after Christmas. 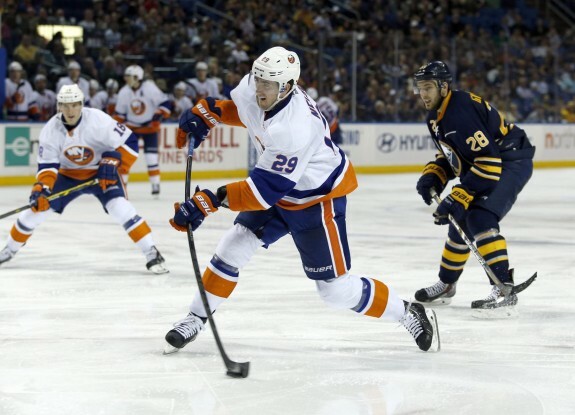 6) Brock Nelson (F New York Islanders) — 20 GP, 10 G, 9 A, 19 PTS = Wow, glad I had him in the Top 10. He came out gangbusters to start the season and has continued to impress. 7) Justin Schultz (D Edmonton) — 20 GP, 2 G, 7 A, 9 PTS = Don’t let those numbers fool you, he’s been a dud considering the amount of power-play time he gets. He was even a healthy scratch recently, so that’s pretty telling. 8) Mark Scheifele (F Winnipeg) — 20 GP, 3 G, 5 A, 8 PTS = Like Granlund and Huberdeau, he’s capable of much more. When Evander Kane got hurt early on, from a collision with Scheifele ironically, that hurt his production too. He could pick it up now that Kane’s back. 9) Seth Jones (D Nashville) — 20 GP, 0 G, 5 A, 5 PTS = Where’s the offence? I guess playing behind Shea Weber, Roman Josi and now Ryan Ellis will prevent a guy from putting up big numbers. He still has big potential. 10) Chris Kreider (F N.Y. Rangers) — 20 GP, 4 G, 8 A, 12 PTS = Not too shabby, right around where I envisioned him. Elias Lindholm has been coming on strong for the Carolina Hurricanes, scoring all 7 of his goals and 11 of his 12 points during the month of November after getting off to a slow start with only 1 assist in 8 games during October. 1) Cory Schneider (G New Jersey) — 20 GP, 9 W, 2.58 GAA , .914 Save% = He set a Devils record by starting every single game to this cutoff, albeit with some mixed results. He’s not in the Vezina conversation like I thought he might be, but he’s giving his team a chance to win most nights. 2) Tyler Toffoli (F Los Angeles) — 20 GP, 8 G, 10 A, 18 PTS = He was leading the Kings in scoring at this cutoff, picking up where he left off in the playoffs. 3) Valeri Nichushkin (F Dallas) — 4 GP, 0 G, 0 A, 0 PTS = The upside is huge, but his season might already be done after undergoing hip surgery. 4) Mika Zibanejad (F Ottawa) — 20 GP, 3 G, 3 A, 6 PTS = This hasn’t been a good year for him. He was very slow out of the gate, then started coming on a bit, but was more recently a healthy scratch. 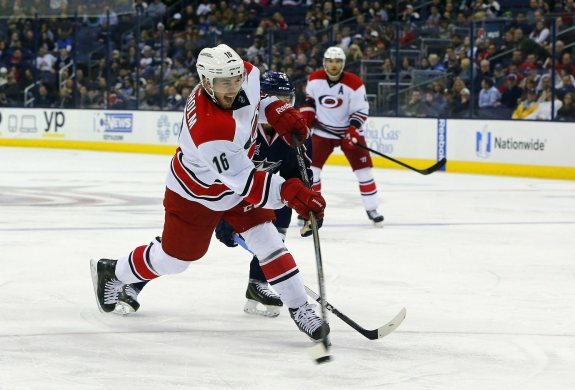 5) Elias Lindholm (F Carolina) — 20 GP, 6 G, 4 A, 10 PTS = He had a quiet October but made a lot of noise in November. He’s coming on strong and is definitely one to keep an eye on. 6) Erik Gudbranson (D Florida) — 20 GP, 1 G, 2 A, 3 PTS = The offence just hasn’t been there so far. He’s certainly not outshining first overall pick Aaron Ekblad (2-9-11) as per my prediction. 7) Nikita Kucherov (F Tampa Bay) — 20 GP, 7 G, 10 A, 17 PTS = The Lightning are so deep up front that he’s sometimes the forgotten man. He’s been a stud this season and is keeping rookie sensation Jonathan Drouin off the top two lines so far. 8) Calvin de Haan (D N.Y. Islanders) — 17 GP, 0 G, 3 A, 3 PTS = Like Gudbranson, his offensive upside isn’t translating to the NHL yet. But in his defence, de Haan’s been stuck down the depth chart much like Jones. 9) Jake Allen (G St. Louis) — 7 GP, 5 W, 2.00 GAA , .922 Save% = He was playing good in a backup role up to this cutoff, but Brian Elliott has since went down to injury and Allen has stepped it up as the starter. 10) Rasmus Ristolainen (D Buffalo) — 20 GP, 1 G, 3 A, 4 PTS = Young defencemen often take longer to develop and that might be what we’re seeing in this Big List, because all these guys with mediocre stats to this cutoff still have very high ceilings. I expect them to pick up the pace sooner than later, including Ristolainen. Sami Vatanen has been piling up the power-play points this season — 12 to be exact — and is proving to be a capable defender despite his diminutive stature. With 6 goals and 20 total points, he’s on pace for 19 goals and 63 points, which is pretty incredible. Devante Smith-Pelly, F — 17 GP, 3 G, 4 A, 7 PTS = Bounced around the depth chart but has left no doubt that he’s an everyday NHL player. Jakob Silfverberg, F — 20 GP, 1 G, 8 A, 9 PTS = He’s been a shootout hero several times but hasn’t been able to finish his chances in regulation (or overtime). There is a sniper here just waiting to break out. Sami Vatanen, D — 20 GP, 5 G, 11 A, 16 PTS = Here’s a young, small defenceman that is having no such trouble putting up points in the NHL. Most his stats have come on the power play, but he’s among the Top 10 breakout performers this season. Emerson Etem, F — 20 GP, 2 G, 2 A, 4 PTS = He’s had his shining moments but when the Ducks get healthy, he might end up in the minors again. Mikael Backlund, F — 11 GP, 1 G, 3 A, 4 PTS = It’s not fair to judge him based on those numbers because he hasn’t been healthy all season and recently underwent abdominal surgery. Joe Colborne, F — 11 GP, 0 G, 8 A, 8 PTS = On a team full of breakout stars, he hasn’t really been one of them to this cutoff. Ben Smith, F — 20 GP, 1 G, 1 A, 2 PTS = I guess he had his breakout last season, with 14 goals and 26 points. A repeat performance doesn’t appear to be in the cards, and he definitely won’t get to 20-20-40 like I assumed he might. Antti Raanta, G — 3 GP, 1 W, 2.03 GAA , .933 Save% = His numbers are good but he’s seldom used to say the least. Jeremy Morin, F — 15 GP, 0 G, 0 A, 0 PTS = Nothing, not a single point. Brandon Mashinter, F — 0 GP, 0 G, 0 A, 0 PTS = Nothing, not a single game played. When Daniel Carcillo came back, his role was redundant and he’s been in the minors all season. Stefan Elliott, D — 0 GP, 0 G, 0 A, 0 PTS = He failed to make the team out of training camp and cleared waivers, but at least he’s putting up nice numbers in the AHL (19-4-9-13). Reto Berra, G — 6 GP, 2 W, 2.76 GAA , .907 Save% = He’s been mediocre at best and might be on the verge of losing his backup role to rookie Calvin Pickard. Kevin Connauton, D — 10 GP, 0 G, 2 A, 2 PTS = He was claimed off waivers by Columbus after 8 games but has already been a healthy scratch with the Blue Jackets too. Colton Sceviour, F — 18 GP, 0 G, 3 A, 3 PTS = Playing a depth role and not producing much. Travis Morin, F — 0 GP, 0 G, 0 A, 0 PTS = He hasn’t been called up yet, but he’s tied for second in AHL scoring (19-9-13-22) after being that league’s MVP last season. What’s holding him back? Size, skating and age in no particular order. Martin Marincin, D — 10 GP, 0 G, 1 A, 1 PTS = He surprisingly didn’t make the team out of training camp, was called up briefly and just recently sent back down. Mark Arcobello, F — 20 GP, 4 G, 4 A, 8 PTS = He’s holding his own but probably wouldn’t be an everyday player on most teams. Anton Lander, F — 0 GP, 0 G, 0 A, 0 PTS = He’s an AHL player at this point (18-4-12-16 in the minors to date). Tanner Pearson, F — 20 GP, 8 G, 3 A, 11 PTS = Another member of That 70s Line, with Toffoli and Jeff Carter, he was tied for the team lead in goals at this cutoff. For a guy that was passed over in two NHL drafts and nearly fell out of the first round in a third, Pearson is proving a lot of people wrong these days. Alec Martinez, D — 17 GP, 2 G, 5 A, 7 PTS = He’s been pretty good overall, coming off the heroics of scoring the Stanley Cup-winning goal in overtime. Kyle Clifford, F — 20 GP, 1 G, 2 A, 3 PTS = He’s a checker, not a scorer. Forgive me for thinking this would be the year he’d put up more points. 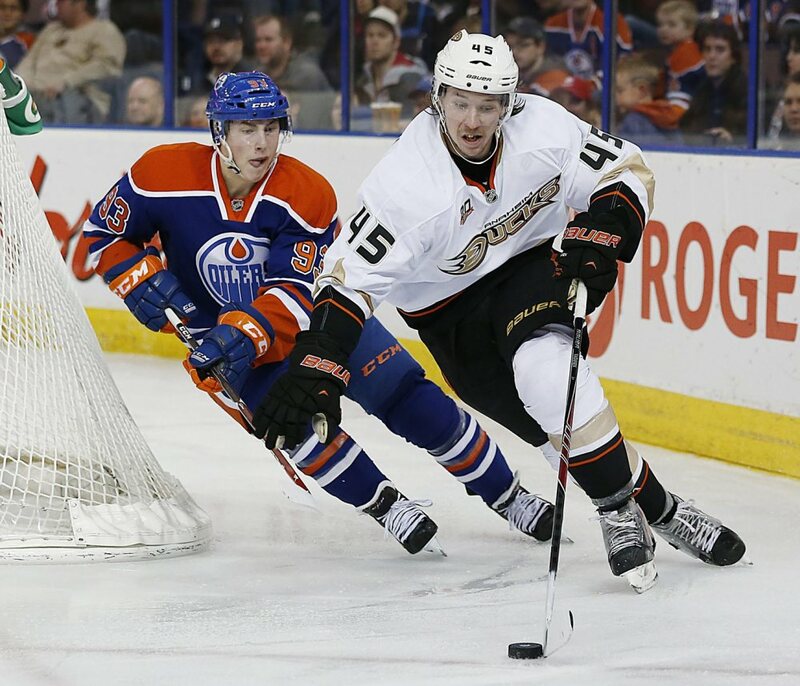 Brayden McNabb, D — 20 GP, 0 G, 4 A, 4 PTS = The fact he suited up for all 20 games is an accomplishment in itself. He wasn’t a roster lock heading into training camp, but the Slava Voynov situation has even allowed McNabb to be paired with Drew Doughty at times. Nino Niederreiter was looking like a borderline bust as a member of the New York Islanders, but he’s now blossoming into a legitimate scoring threat for the Minnesota Wild. He’s on pace for almost 40 goals, which would exceed his career-high point total of 36 from last season. That’s goals, not points, we’re talking. Jonas Brodin, D — 12 GP, 0 G, 2 A, 2 PTS = Another young defenceman struggling to produce offensively. He hasn’t been healthy for much of the season in his defence. Charlie Coyle, F — 20 GP, 2 G, 8 A, 10 PTS = He’s been OK, but just OK. He can be better. Nino Niederreiter, F — 20 GP, 10 G, 3 A, 13 PTS = He’s been good, make that great actually. He’s finally found his scoring touch at the NHL level. Think the Islanders would like a mulligan on that Cal Clutterbuck swap? Umm, yeah. Erik Haula, F — 18 GP, 2 G, 0 A, 2 PTS = He was pretty dynamic in the playoffs but has been pretty ‘meh’ in this regular season so far. Craig Smith, F — 20 GP, 6 G, 5 A, 11 PTS = He hasn’t been bad, but he was actually better last season when he scored 24 goals and 52 points in 79 games. He’s on pace for 25 goals but only 45 points over 82 games this season. Ryan Ellis, D — 20 GP, 1 G, 8 A, 9 PTS = He’s stuck behind Weber and Josi, but he’s pushed himself ahead of Jones for offensive opportunities. All in all, Ellis is having his best year yet. Colin Wilson, F — 18 GP, 3 G, 4 A, 7 PTS = Those numbers aren’t very good, but he’s been picking up the pace more recently. Mattias Ekholm, D — 20 GP, 0 G, 6 A, 6 PTS = He had a 5-game point streak but has otherwise been quiet while pairing with Ellis. Logan Couture, F — 20 GP, 7 G, 9 A, 16 PTS = He’s on pace for 65 points, which would match his career high. Not really a breakout, but not a setback by any means either. Tomas Hertl, F — 20 GP, 4 G, 5 A, 9 PTS = He’s been bit by the sophomore slump at times, perhaps also still feeling the effects of his knee injury from last season. He should pick up the pace over his next 20 games. Alex Stalock, G — 5 GP, 2 W, 2.38 GAA , .925 Save% = Solid numbers, but he was the clear No. 2 behind Antti Niemi before suffering a knee injury that required minor surgery. He has starter potential, but he probably won’t reach that level this season. Matt Nieto, F — 19 GP, 1 G, 5 A, 6 PTS = He’s been unable to produce much with quality linemates and was recently a healthy scratch, but his advanced stats still show a productive player with potential to breakout. Like Hertl, he’s a bit of a sophomore slumper. James Sheppard, F — 14 GP, 3 G, 2 A, 5 PTS = He was hurt to start the season, but has been pretty good since returning to the lineup. He would be on pace for about 30 points over a full season, which would have been a career high. He seems to be taking a small step forward. Tye McGinn, F — 11 GP, 0 G, 2 A, 2 PTS = Nothing to see here. He’s been scratched lately. Freddie Hamilton, F — 0 GP, 0 G, 0 A, 0 PTS = Ditto here. He’s in the minors, but does have 12 points in 14 AHL games. He’ll be 23 on New Year’s Day, so he needs to make the jump and establish himself as an everyday player sooner than later. 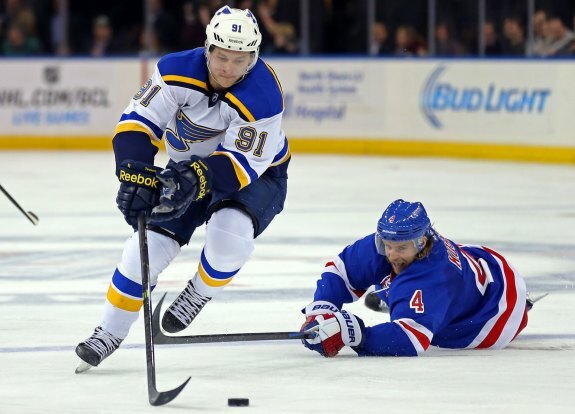 Vladimir Tarasenko made the New York Rangers look silly on this particular play, which culminated in a highlight-reel goal for the St. Louis Blues. He’s turning into an electrifying player, on pace for almost 50 goals and nearly 90 points. Vladimir Tarasenko, F — 20 GP, 12 G, 11 A, 23 PTS = Here’s your No. 1 breakout star to this cutoff. He’s not slowing down either. This guy is legit and belongs at the very top of this list. Magnus Paajarvi, F — 8 GP, 0 G, 1 A, 1 PTS = There are too many talented forwards ahead of him in St. Louis. Perhaps he’ll eventually get another chance elsewhere. Zack Kassian, F — 15 GP, 2 G, 3 A, 5 PTS = He hasn’t been one of the bright spots on a team full of them. He’ll need to find another gear once healthy, or he might end up in the press box. Chris Tanev, D — 20 GP, 0 G, 5 A, 5 PTS = Young D, no offence. That’s not to say he (or those aforementioned young D) are playing bad, but they aren’t producing and shouldn’t be on your fantasy team unless it is a keeper league. Shawn Matthias, F — 20 GP, 2 G, 3 A, 5 PTS = He’s not putting up big numbers either, but he’s been fairly effective in a checking role despite somehow being a team-worst minus-11 amongst mostly plus players. Something tells me his Corsi is more flattering than his plus-minus. Derek Dorsett, F — 18 GP, 2 G, 4 A, 6 PTS = This is actually a breakout for him. He’s up to 8 points in 22 games, which prorates to 30 points — a career high (previous best 20). He’s also on pace for 183 penalty minutes. Jacob Trouba, D — 20 GP, 2 G, 1 A, 3 PTS = Add him to the long list of underachieving young defencemen. Trouba has caught fire since this cutoff and now has 2 goals and 7 points in 25 games, more than doubling his production. Carl Soderberg, F — 20 GP, 5 G, 8 A, 13 PTS = He got off to a real hot start and was leading the Bruins in scoring for some time. He’s breaking out, which means he’s going to earn a big contract from Boston or some other team as a UFA come July. Matt Bartkowski, D — 7 GP, 0 G, 1 A, 1 PTS = He hasn’t been very good and has actually taken a step back from last season, resulting in several healthy scratches. Niklas Svedberg, G — 5 GP, 2 W, 2.41 GAA , .917 Save% = His stats are comparable to starter Tuukka Rask, but that’s a tough guy to steal playing time from. Svedberg seems like the next Anton Khudobin, in a good way. He’s got the potential to be a No. 1, but it probably won’t happen in Boston, not with Malcolm Subban also waiting in the wings. Ryan Spooner, F — 5 GP, 0 G, 0 A, 0 PTS = He wasn’t quite ready to make the jump again this season. Maybe if he was a natural winger rather than a centre, it would be a different story. He has 3 goals and 13 points in 17 AHL games. Tyler Ennis and the Buffalo Sabres are suddenly exceeding expectations and taking themselves out of the Connor McDavid sweepstakes. He’s small but super skilled, and those skills are translating into points. Tyler Ennis, F — 20 GP, 6 G, 6 A, 12 PTS = He’s leading his team in scoring, but that’s not saying a whole lot considering he plays for the low-scoring Sabres. Barring injury, he should surpass 50 points for the first time in his career. Cody Hodgson, F — 20 GP, 1 G, 1 A, 2 PTS = Does he not want to play for Buffalo either? He’s got far too much skill to only have 2 points in 20 games, so it makes me think there is an attitude issue as well. This could become a case of shape up or ship out. Zemgus Girgensons, F — 20 GP, 6 G, 4 A, 10 PTS = On the flip-side, this guy seems to have the makings of a franchise player in the Mike Peca mould. He may never score 40 goals or top 70 points, but he could become a perennial 30-30-60 player with intangibles. He’s worked his way up to the top line already, so his numbers should go up from here. Marcus Foligno, F — 14 GP, 2 G, 1 A, 3 PTS = He gave a late-season, point-per-game tease as a rookie a few years ago, but that offence is nowhere to be found nowadays. Then again, his brother Nick took a while to find his scoring touch too. Mikhail Grigorenko, F — 0 GP, 0 G, 0 A, 0 PTS = The Sabres are trying to right their own wrong by now letting him develop in the AHL (21-7-8-15) after initially rushing him to the NHL. He might be ready to displace Hodgson sooner than later. Jhonas Enroth, G — 10 GP, 2 W, 3.63 GAA , .900 Save% = He’s went on a little run as the starter since this cutoff, winning 4 of his last 5 games and improving his numbers to 3.11 and .914. That’s pretty decent for anybody tasking with backstopping the Sabres. Michal Neuvirth, G — 10 GP, 3 W, 2.85 GAA , .920 Save% = He’s been relegated to backup for the time being despite splitting starts to this cutoff and posting the better statistics. He’ll get his opportunities eventually, when Enroth inevitably gets a shelling. Jeff Skinner, F — 16 GP, 5 G, 6 A, 11 PTS = He’s putting up pretty good stats considering he’s bounced around the depth chart and hasn’t had the most skilled linemates at times. If he stays healthy, he could still come close to 60 points. Ryan Murphy, D — 6 GP, 0 G, 1 A, 1 PTS = Young defenceman, need I say more? He’s in that same stage as so many on this Big List, but some are starting to doubt his ability. He’s back in the AHL for now, with 6 assists through 11 games. Zach Boychuk, F — 17 GP, 3 G, 2 A, 5 PTS = He’s finally become something of a regular in Carolina’s lineup after a strange full-circle experience early in his career. He established himself as a point-per-game AHL player, so he should be capable of providing more offence once he fully adjusts to the change of pace. Ryan Murray, D — 4 GP, 0 G, 0 A, 0 PTS = He’s been pretty injury plagued to start his NHL career, but the former second overall pick should take some strides once healthy. Cam Atkinson, F — 19 GP, 7 G, 3 A, 10 PTS = He was on pace to score 30 goals at this cutoff but hasn’t found the back of the net in 4 games since. He had 21 goals and 40 points last season, so he should finish around there again. Boone Jenner, F — 9 GP, 1 G, 5 A, 6 PTS = Like so many of his teammates, he missed time to injury and is still trying to find his groove. He should pick up the pace soon enough. Matt Calvert, F — 11 GP, 2 G, 1 A, 3 PTS = Ditto here, same story as Jenner, albeit with slightly less offensive upside. David Savard, D — 20 GP, 4 G, 3 A, 7 PTS = He’s been one of the bright(er) spots for Columbus and has been earning power-play time as a result. It’ll be interesting to see what he develops into over the next couple seasons. Tim Erixon, D — 17 GP, 1 G, 5 A, 6 PTS = Ditto here, same story as Savard. Brendan Smith, D — 18 GP, 2 G, 4 A, 6 PTS = He was pointless after 8 games, slumping like so many young blue-liners, but he’s picked up the pace and could be on the verge of breaking out. Danny DeKeyser, D — 20 GP, 0 G, 7 A, 7 PTS = He’s since scored his first goal of the season and is up to 10 points in 24 games, which is a 34-point pace. That would be a positive step in his progression after putting up 23 points last season. Riley Sheahan, F — 20 GP, 3 G, 6 A, 9 PTS = It’s tough to tell how much offensive upside he truly has, but he’s certainly going to be a serviceable player for the foreseeable future. Jakub Kindl, D — 16 GP, 2 G, 2 A, 4 PTS = He struggles to stay out of Mike Babcock’s doghouse, but he’s capable of being pretty effective when in the lineup. He could be potential trade bait if Detroit becomes a buyer. Sasha Barkov, F — 17 GP, 2 G, 1 A, 3 PTS = He should have higher point totals given his talent. I nearly had him on the My 10 list but didn’t want to go too heavy on the Panthers. Nick Bjugstad, F — 20 GP, 8 G, 4 A, 12 PTS = Same here and he likely should have made that list over Huberdeau and-or Gudbranson, among others. Bjustad got off to a slow start, with only 1 assist in his first 10 games, but he’s been on a tear ever since, including a 4-point game. He’s a big guy, at 6-foot-6, with real big upside. Al Montoya, G — 3 GP, 1 W, 1.99 GAA , .926 Save% = He’s been called upon more since this cutoff, with Roberto Luongo sidelined by injury, but Montoya’s numbers have remained solid at 2.00 and .923 in 8 appearances. Brandon Pirri, F — 6 GP, 3 G, 1 A, 4 PTS = He’s been a point machine since getting traded to the Panthers late last season (21-7-7-14 to end 2013-14). There’s a lot of competition among forwards in Florida, but he’s earning a regular role. Jimmy Hayes, F — 13 GP, 4 G, 5 A, 9 PTS = Same here, another guy who is establishing himself as an everyday player with offensive upside. His production will probably slow down a bit, but he’s also 6-foot-6 and those guys don’t grow on palm trees, so Florida probably has another keeper in Hayes. Drew Shore, F — 0 GP, 0 G, 0 A, 0 PTS = He’s biding his time in the minors, putting up nearly a point-per-game in the AHL (20-5-14-19). He’ll get recalled at some point and might not go back down. Lars Eller, F — 20 GP, 5 G, 3 A, 8 PTS = After going pointless with a combined minus-6 rating in his first 5 games, Eller has been much better as of late. Those totals still don’t constitute a breakout, on pace for 35 points after putting up 30 in just 46 games during the lockout year. Alexei Emelin, D — 18 GP, 0 G, 6 A, 6 PTS = He had 4 assists in his first 3 games while paired with P.K. Subban, then endured a 13-game point drought. But his value extends beyond offensive contributions, in the form of a hard-hitting, shot-blocking shutdown defender. Dale Weise, F — 17 GP, 3 G, 5 A, 8 PTS = The offence has been pretty surprising and probably isn’t sustainable, but he’s been great in his energy role. Montreal fans love him and for good reason. Jon Merrill, D — 11 GP, 1 G, 3 A, 4 PTS = He’s been OK, but nothing special so far. 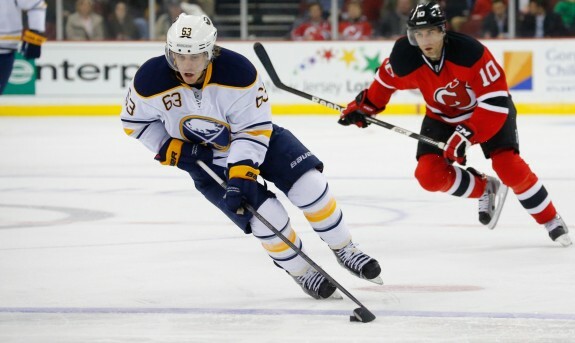 Like most Devils defencemen, he’s been outshone by rookie sensation Damon Severson. Ryan Strome, F — 20 GP, 4 G, 11 A, 15 PTS = He’s definitely having a breakout season and getting better with every game it seems. He’s on pace for just over 60 points, which would be pretty remarkable for a guy that only had 37 games (and 18 points) on his NHL resume prior to this season. Travis Hamonic, D — 16 GP, 2 G, 2 A, 4 PTS = He’s probably not going to be a big point-producer, but he’s a key player for this team. Chad Johnson, G — 7 GP, 5 W, 3.33 GAA , .876 Save% = He won his first 3 starts but has alternated wins and losses since with less-than-stellar stats. Jaroslav Halak is the clear starter, so Johnson has been doing more watching than playing lately. T.J. Brennan, D — 0 GP, 0 G, 0 A, 0 PTS = He was traded to Chicago as a throw-in for Johnny Boychuk and has yet to play an NHL game. That call-up could be coming soon, as he’s dominating the AHL again with 4 goals, 17 points and a plus-12 rating in 22 games. Justin Johnson, F — 0 GP, 0 G, 0 A, 0 PTS = His knockout of John Scott to end last season didn’t have a lasting effect. He really hasn’t been heard from since, and is actually playing for the ECHL’s Alaska Aces this season. This guy is by far the most erroneous name on this Big List and I apologize for that. John Moore, D — 15 GP, 0 G, 3 A, 3 PTS = He’s the new Anton Stralman, paired with Marc Staal as a shutdown tandem. That means his offence is being suppressed, at least for the time being. J.T. Miller, F — 3 GP, 0 G, 0 A, 0 PTS = He just had a 2-point game including his first goal of the season, but that probably won’t be enough to keep him in the NHL once the Rangers get healthy again. Kyle Turris, F — 20 GP, 4 G, 10 A, 14 PTS = Not terrible like Hodgson, but not great either. His goal total is a little concerning, considering he’s supposed to be a No. 1 centre with Jason Spezza no longer in Ottawa. That’s a 57-point pace, so essentially the same as last season (58). Robin Lehner, G — 8 GP, 4 W, 2.85 GAA , .916 Save% = Goaltending has been a strength for the Senators this season, but Craig Anderson has been a bit better than Lehner overall. Anderson is still the starter, but Lehner is earning his share of crease time. Jared Cowen, D — 15 GP, 1 G, 4 A, 5 PTS = He’s another guy still finding his way in the league. He was a healthy scratch for a few games, but has been better since returning to the lineup. Cody Ceci, D — 20 GP, 0 G, 7 A, 7 PTS = He just scored his first goal of the season and is proving to be Ottawa’s second most offensive blue-liner behind Erik Karlsson. He could hit 30 points after registering just 9 points in 49 games as a rookie last season. Mike Hoffman, F — 17 GP, 7 G, 2 A, 9 PTS = He got on a little hot streak with 6 goals in 5 games but has since went 7 games without a goal. Still, he had 10 points after 20 games, which makes him a pleasant surprise for the Senators and meets the criteria for a breakout player. Brayden Schenn, F — 20 GP, 7 G, 8 A, 15 PTS = He’s ripping it up pretty good, now up to 17 points in 23 games for a 61-point pace. He had a career-high 41 points last season, but you could totally see there was more offensive upside to his game. Sean Couturier, F — 20 GP, 4 G, 4 A, 8 PTS = You’d think he could have better numbers too, but his two-way game is already elite. The offence should come in time and perhaps as this season progresses. Luke Schenn, D — 17 GP, 1 G, 1 A, 2 PTS = Whatever brother Brayden is drinking these days, he needs to share it with Luke. Then again, you can’t really drink hockey sense and that might be what Luke is lacking as a team-worst minus-8. 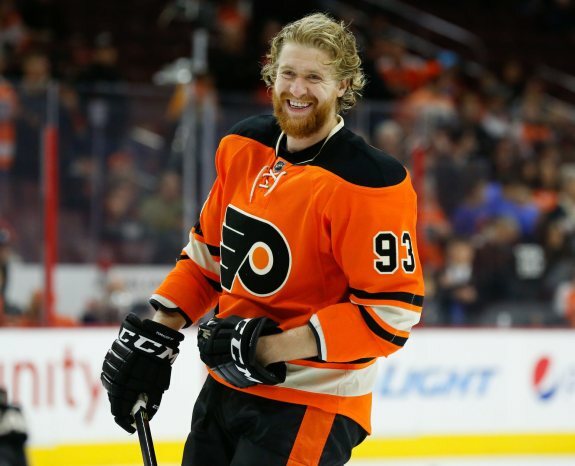 As the Flyers get healthy on defence, he could be the odd-man out. Michael Raffl, F — 12 GP, 6 G, 1 A, 7 PTS = He got hurt at a terrible time, just as he was clicking with Jakub Voracek and Claude Giroux on the top line with 4 goals and 5 points in a span of 3 games. He’s now pointless in 3 games since returning on a different line. Patric Hornqvist is older than the majority of guys on this Big List, but he’s making a name for himself as a member of the Pittsburgh Penguins this season. That’s thanks in large part to Sidney Crosby, who can make anybody look good, but Hornqvist has actually looked great so far. 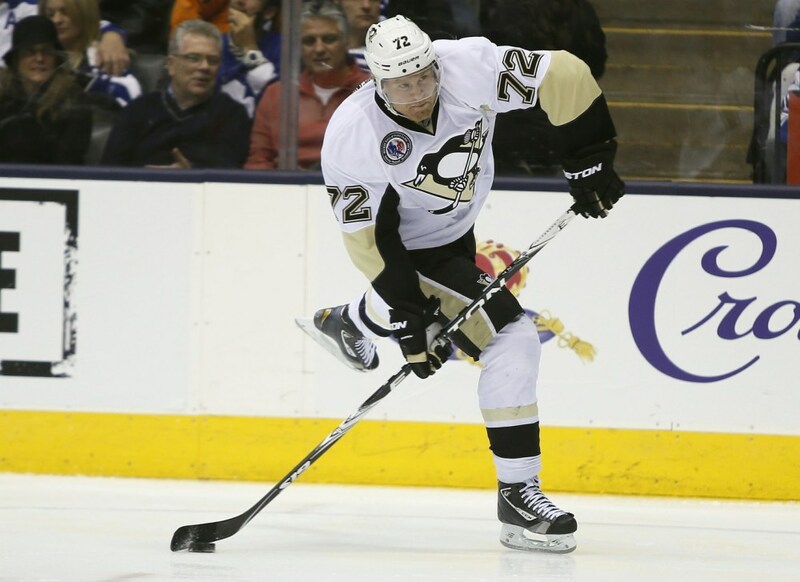 Patric Hornqvist, F — 20 GP, 10 G, 14 A, 24 PTS = He really is going to score 40 goals, isn’t he? I thought I was overestimating for a bit of shock value with that prediction, assuming it was a long-shot, but it’s now looking quite possible. That said, he’s also on pace for 98 points and we all know that ain’t happening. Around 78 should be obtainable, which would still be 25 more than his previous career high of 53. If he looked out of place on this Big List in September, he looks like the perfect fit now. Beau Bennett, F — 7 GP, 1 G, 2 A, 3 PTS = He had a 3-point game, showing a glimpse of his potential, but he’s been otherwise pointless. If he could ever stay healthy, this kid could have a Hornqvist-esque season next year. Simon Despres, D — 19 GP, 1 G, 4 A, 5 PTS = He’s sticking in the NHL so far this season and having a decent impact in limited minutes as part of Pittsburgh’s third pairing. Anton Stralman, D — 20 GP, 2 G, 8 A, 10 PTS = Up to 13 points in 25 games, he’s already matched his total from 81 games last season (when he only had 1 goal). He’s looking a lot more like the 34-point Stralman from 2009-10 with Columbus, and he should only get better now that Victor Hedman is back. He’s actually on pace for 43 points, so this is as much a breakout as it is a resurgence. Brett Connolly, F — 8 GP, 2 G, 0 A, 2 PTS = He missed some time to injury, but just had a 2-goal game to double his total to 4 points. He was a sniper in junior and a former first-round pick, but he hadn’t been able to stick in the NHL until this season. He’ll be an interesting one to watch over the next 20-game segment. Radko Gudas, D — 16 GP, 1 G, 2 A, 3 PTS = He’s settled down a bit in the penalty-minute department (28), which hurts his fantasy value. He’s a lot like Emelin in that his impact can’t be measured by his stat-line. Andrej Sustr, D — 18 GP, 0 G, 3 A, 3 PTS = Ditto here, but he managed to make veteran Eric Brewer expendable, so he must be doing something right above and beyond those 3 helpers. Mark Barberio, D — 5 GP, 0 G, 0 A, 0 PTS = He’s been a healthy scratch more often than not and hasn’t lived up to his high-scoring AHL ways. Jake Gardiner, D — 18 GP, 1 G, 3 A, 4 PTS = He got the big contract extension in the summer but hasn’t done much to earn it to this point. What I really need is a Big List of underachieving young defencemen, which he would be on. Morgan Rielly, D — 19 GP, 2 G, 5 A, 7 PTS = He’s capable of more too, but he hasn’t been nearly as underwhelming as Gardiner to this cutoff. One of them is going to emerge over the next 20 games I have a feeling. Peter Holland, F — 20 GP, 4 G, 4 A, 8 PTS = He’s off to a nice start in what should be a breakout campaign. Toronto had a lot of forward depth on paper in training camp and it was hard to tell where Holland fit in, but he’s earned a regular role and been a good source of secondary scoring too. Karl Alzner, D — 20 GP, 0 G, 3 A, 3 PTS = I guess the pigeon-holers were right, he’s a defensive specialist through and through. My bad for thinking he had more offence to give this season. Tom Wilson, F — 10 GP, 1 G, 2 A, 3 PTS = He missed the start of the season to injury and is still getting up to speed. He’s up to 5 points in 13 games, so keep an eye on him over the next 20 games especially if he gets an extended stint on the top line with Alex Ovechkin and Nicklas Backstrom. Recognize this guy? That’s Jakub Voracek, who is second only to Sidney Crosby in the NHL scoring race and is on pace for more than 100 points. Jakub Voracek (F Philadelphia) — 20 GP, 7 G, 22 A, 29 PTS = Second only to Sidney Crosby in NHL scoring to this cutoff, he’s really taken his game to the next level. Voracek had a career-high of 62 points last season (his previous best had been 50), so I figured he’d be in that 60-to-70-point range again. He just might hit triple-digits at this rate, but he won’t reach the 119 that he’s on pace for. Nick Foligno (F Columbus) — 19 GP, 10 G, 10 A, 20 PTS = The Blue Jackets are in the midst of a miserable season, but Foligno is actually excelling. He’s kept it up with 22 points through 23 games, which prorates to 78 over 82 games. His previous career-high was 47 points, with 18 goals, but he should be good for a 30-30-60 season even if he slows down at some point. Derick Brassard (F N.Y. Rangers) — 20 GP, 6 G, 10 A, 16 PTS = He’s now got 20 points after 24 games, which prorates to 68 points. Like Foligno, his career high was 47 points back in 2010-11 with the Blue Jackets, so he should easily surpass that mark. Riley Nash (F Carolina) — 20 GP, 4 G, 11 A, 15 PTS = If you bet on him to be the Hurricanes’ leading scorer at this cutoff, you’d be a rich man. The odds would have paid off-the-charts, but Nash has been racking up the points nevertheless. Thought to be more of a “checker”, he’s proving to be quite the playmaker thus far. He had 10 goals and 24 points in 73 games last season, both career highs that are bound to be beat this season. Obliterated if he keeps this 62-point pace up. Leo Komarov (F Toronto) — 20 GP, 1 G, 11 A, 12 PTS = He’s up to 4 goals and 16 points in just 22 games, which matches his career high in goals from 42 games in 2012-13. He only had 9 points that year, so he’s nearly doubled that previous best in the midst of a career year after returning from another KHL stint last season. Matt Beleskey (F Anaheim) — 20 GP, 8 G, 1 A, 9 PTS = He’s up to 12 goals and 14 points in 26 games, already bettering his previous-best of 11 goals in 60 games from back in 2009-10. He hadn’t even been a regular in the lineup since then, but Beleskey was tied for 6th among NHL leaders in goals with Alex Ovechkin and Max Pacioretty. That’s some pretty elite company, but give Beleskey props for this breakout year. Tommy Wingels (F San Jose) — 20 GP, 5 G, 5 A, 10 PTS = He’s up to 7 goals and 15 points in 25 games, thanks to a recent 4-point performance. That puts him on pace for 23 goals and 49 points, a nice jump from 16 goals and 38 points in what was already a breakout last season. Jason Zucker (F Minnesota) — 20 GP, 8 G, 2 A, 10 PTS = Another guy with way more goals than assists, now at 9 goals and 12 points in 23 games. He’s probably not going to score 32 goals, but he’s already exceeded everybody’s expectations after consecutive seasons of 4 goals and 5 points. Heck, even 32 points would be a big breakout for Zucker. Lance Bouma (F Calgary) — 19 GP, 5 G, 3 A, 8 PTS = The Flames are full of overachievers, or rather surprises at this cutoff. Bouma is definitely on that list, having already matched his career high in goals from 78 games last season. He should nearly double his career-high point total of 15 too. Paul Byron (F Calgary) — 20 GP, 4 G, 4 A, 8 PTS = Same story here, as he’s up to 5 goals and 10 points in 25 games. That prorates to 16 goals and 32 points, which seems high for him, but Byron did quietly put up 7 goals and 21 points in only 47 games last season (12 and 37 over 82). Mark Giordano (D Calgary) — 20 GP, 6 G, 15 A, 21 PTS = Carrying on with the Calgary connection but switching positions, this guy is legitimately in the running for the Norris and perhaps even the Hart trophy. He’s been Calgary’s MVP and has the Flames near the top of the Western Conference standings, which is way higher than anybody anticipated. Giordano was named the NHL’s first star for the month of November and was leading all defencemen with 25 points in 25 games, which is simply stunning. T.J. Brodie (D Calgary) — 20 GP, 4 G, 12 A, 16 PTS = Giordano’s defence partner has heated up even more since this cutoff, taking his totals to 6 goals and 21 points in 25 games, which ranks him second only to Giordano among NHL defence scoring leaders. Raise your hand if you saw that coming . . . now put it down, because you are lying. Brodie isn’t going to put up 69 points and I can’t see Giordano coming close to 82 either. I would think 50 and 70 are more realistic targets for them, which would still equate to big-time breakouts for both. Cody Franson (D Toronto) — 18 GP, 3 G, 11 A, 14 PTS = He was at 4 goals and 15 points after 21 games, which is almost halfway to his career-highs of 8 and 33, respectively. He’s a pending UFA, which adds plenty of incentive to keep piling up the points and he’s on pace for 16 goals and 59 points. Pat yourself on the back if you picked him for your fantasy team. Johnny Boychuk (D N.Y. Islanders) — 19 GP, 2 G, 11 A, 13 PTS = He had 6 points in his first 3 games with the Islanders, then went 5 games without a point and hasn’t scored a goal since. His offence has been sporadic after that hot start, but he should still top last season’s career-high of 23 points with the Boston Bruins. He’s on pace for 55 points but 40 would be a breakout by his standards. Trevor Daley (D Dallas) — 20 GP, 5 G, 6 A, 11 PTS = He was another fast-starter, with 3 goals and 6 points in his first 6 games. He had 4 goals and 9 points after 10 games, then along came some kid named John Klingberg to bump him off the Stars’ top power-play unit. Daley only has 3 points in his last 14 games, but his career highs are 9 goals and 25 points from 67 games last season. Do the math and he’s still on pace for 17 goals and 41 points, with the latter possibly obtainable. Kevin Klein (D N.Y. Rangers) — 19 GP, 4 G, 2 A, 6 PTS = He’s added 2 assists for 8 points after 23 games, but his goal-scoring prowess has really come out of left field. His 4 goals already match a career high and he’s on pace for 29 points, which would be 8 more than his previous best of 21 from 66 games with Nashville in 2011-12. Darcy Kuemper (G Minnesota) — 15 GP, 9 W, 2.03 GAA , .919 Save% = Remember when this guy almost signed in the KHL because the Wild wouldn’t give him a 1-way deal? Wow, Chuck Fletcher must be glad he caved on that contract demand. Kuemper started the season with back-to-back shutouts over playoff rival Colorado to secure the starter role, and won 6 of his first 8 games. He had a mini-slump, losing 3 in a row, but bounce back to win 3 straight again.